Note: This is part 1 of 3 in this #HappinessHappensMonth celebration series. The following is an excerpt from The Happiness Toolbox by PESI expert and author Jonah Paquette, PsyD. ● First, we acknowledge the goodness that is present in our lives. ● Second, we recognize that the source of these blessings lies, at least partially, outside of our own doing. Gratitude can be an external, visible behavior, such as the act of thanking someone, but it can also be a private or internal process, such as acknowledging and reflecting on the good aspects of our lives. An explosion of research on the many benefits of gratitude has marked the past decade or so. As it turns out, gratitude is not merely an emotion that feels good; it actually holds the key to a number of psychological, physical, and social benefits as well. Studies show that individuals who regularly practice gratitude perform better across a number of areas when it comes to mental and emotional health. Gratitude has been linked to lower rates of depression, along with creating a buffer against future depressive episodes. It has also been shown to decrease stress levels, while enhancing positive mental states such as joy, optimism, and tranquility. Not only are grateful individuals happier, but research suggests that they are healthier as well. Studies have found that individuals who regularly practice gratitude have improved overall physical health, stronger immune systems, and reduced rates of stress-related illnesses. Not only that, but research has linked the practice of gratitude to other benefits such as getting better sleep (as much as an extra hour per night), and exercising more (as much as 90 minutes more per week). Many studies have shown that grateful individuals have stronger interpersonal relationships, including more satisfying romantic relationships. They are also more altruistic, making them more likely to donate to charities and engage in volunteer work. They are even able to let go of resentments easier and foster forgiveness. A gratitude practice impact our brain in several ways. First, on a structural level, the practice of gratitude has been linked to two areas of the brain in particular: the hypothalamus and the left prefrontal cortex. Though small in size, the hypothalamus is mighty in function, and it impacts things like our stress level, our sleep, and even our metabolism. The left prefrontal cortex, conversely, has been linked to positive emotional states, including happiness, compassion, love, and joy. On a chemical level, gratitude has been linked to several neurotransmitter systems, including serotonin and dopamine. Serotonin influences a number of bodily functions and is thought to be strongly connected to our moods. Low levels of serotonin are thought by some researchers to be linked to higher rates of depression, and gratitude may increase the levels of serotonin in our brain. Dopamine, on the other hand, is considered a “feel good” neurotransmitter and plays a role in our ability to anticipate rewards and pleasure. Studies suggest that the practice of gratitude may increase levels of dopamine in our brains too. 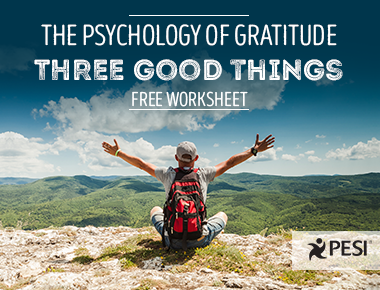 Help your clients discover the benefits of Gratitude with this FREE Gratitude Exercise. 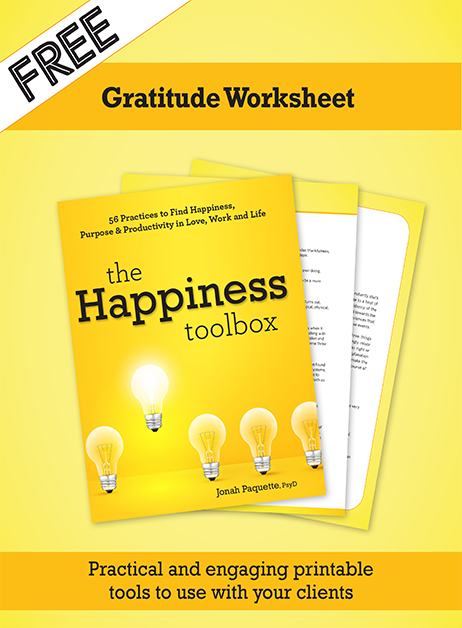 Check out Three Good Things Worksheet taken from the Happiness Toolbox.